Is the Supreme Court's decision a debacle for democracy -- or an opportunity for corporate social responsibility? If the worldwide movement for corporate social responsibility didn't exist, we would have to invent it after the US Supreme Court's January 21, 2010, decision to lift all limits on corporate money in politics. This 5-4 decision drew instant cries of alarm from constitutional lawyers, including President Obama, who said "the Supreme Court has given a green light to a new stampede of special interest money into our politics. It is a major victory for big oil, Wall Street bankers, health insurance companies and other interests that marshal their power every day in Washington and drown out the voices of everyday Americans." Republican leaders hailed the ruling as "a victory for the First Amendment." Our local Congressman in Florida, Alan Grayson (D-8) called it "the worst decision since the Dred Scott case" and has introduced six bills to roll back this ruling by tightening corporate governance. Enter CSR and SRI advocates! How will institutional and individual investors respond -- all now crucial players in this debate? Congressman Barney Frank and Senator Chris Dodd are exploring regulatory restrictions on corporations on the likely new flood of corporate money drowning out ordinary votes. The White House is proposing new legislation. CSR and SRI leaders can have a major role! Ethical Markets Advisory Board members Robert A. G. Monks, author of Corpocracy (2007), Matthew Kiernan, author of Investing in a Sustainable World (2009) and founder of Innovest, Wayne Silby, founder of Calvert, Alice Tepper-Marlin, President of Social Accountability International and Amy Domini, author of Socially Responsible Investing (2000) and founder of Domini Social Investments, are all naturals! The clearest arguments against the Court's ruling: the First Amendment protects the speech of people (corporations were not invented until after the Constitution). The Supreme Court's decision in 1886, mistakenly documented by court reporter Bancroft Davis, never held corporations as "persons" with all the rights of real individual people. But this error has persisted, even though corporations have fewer responsibilities and limits on corporate liability. This 1886 mistake can now be overturned. Including unions in the new Court ruling is a red herring since unions represent real people while corporations are chartered to delver profits to shareholders. Key proposals can include: tightening corporate governance through regulatory agencies, particularly the SEC, so that corporations must get prior approval from their shareholders for such new political financing while enforcing immediate public disclosure of such funds and recipients. Does the company's board composition fairly represent both political parties and independents? Have shareholders approved this political use of funds? How does the company wield political power and in what specific ways: lobbying, campaign contributions, public relations, advertising, media buys at local, state and federal levels? What proportion of corporations’ shares is owned by non-US investors, including sovereign wealth funds? Is the content of corporate advertising fair, truthful and not biased to favor political parties or candidates? Kudos to two of our favorite CSR companies, Ben and Jerry's and Mens Wearhouse, that joined in with a group of global companies in an open letter to Congress members complaining about the shake-downs for campaign contributions by both parties and opting out of the emerging money arms race. Let's all step up to the plate on this crucial threat to our democracy and make our voices count! 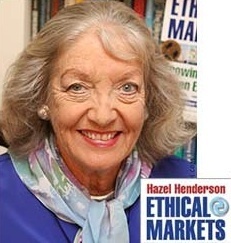 Hazel Henderson is president of Ethical Markets Media (USA and Brazil), author of many books and co-creator of the Calvert-Henderson Quality of Life Indicators. She founded the EthicMark Award for advertising, which has started signing up companies in a campaign against the emerging practice of neuromarketing. READERS: What’s your Talkback to the question: Is the Supreme Court's decision a debacle for democracy -- or an opportunity for corporate social responsibility? Let us know, and we’ll respond.